After only having a 10 minute power nap around 10:30 am she was exhausted and fussy but fighting sleep at 1:30. 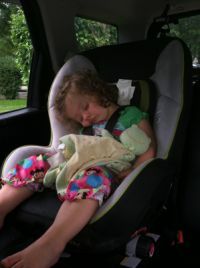 I decided to put her in the car and go for a drive in hopes that she would fall asleep. An hour later she passed out 2 minutes from the house. The nap only lasted an hour and 10 minutes, wasn't long enough. Aubriella did go to sleep at 9:30 pm with no fight.